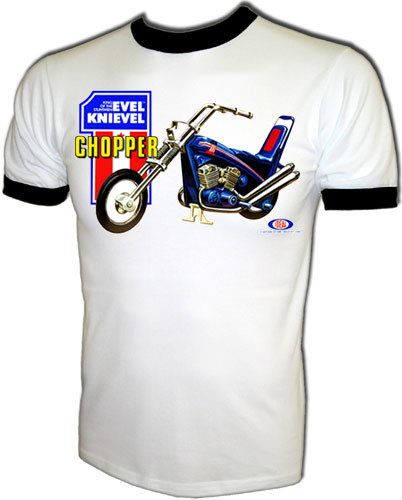 An authentic licensed Evel Knievel shirt featuring a vintage iron-on heat transfer print on a new and unused shirt. Original 1973 Ideal Toy Company promotional print. Yes, this is the same image they used on their "gyro-powered" motorcycle stunt cycle toyline over thirty years ago! 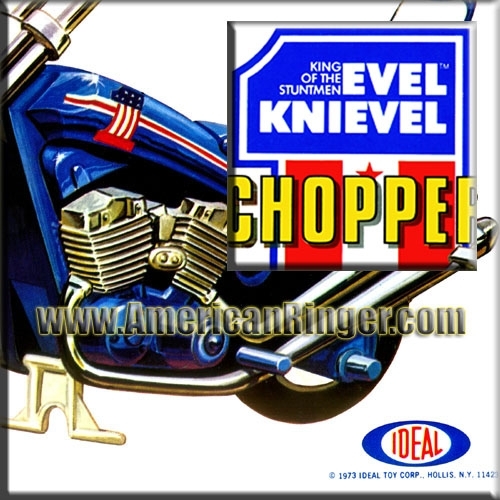 Yes, this is the same original Evel Knievel that inspired a generation of BMX stuntmen and backyard daredevils. Does anyone still have their Ideal "Strato-Cycle" from the "Viva Knievel" movie? A vintage American Ringer EXCLUSIVE, RARE AND HIGHLY COLLECTIBLE! These shirts are extremely difficult vintage items to find and will sell out very quickly so get yours today! AmericanRinger.com acquired these rare vintage shirts and NOBODY ELSE HAS THEM! This is the real deal vintage stuff and once they are gone they will be gone forever.